BRITNEY SPEARS CONFIRMS TWO MORE YEARS AT PLANET HOLLYWOOD: International pop icon Britney Spears is “doing it again!” While on stage performing her hit song “3,” Spears announced she will extend her headlining residency show, “Britney: Piece of Me” at The AXIS in Planet Hollywood through December 2017. In addition, her spectacular show will soon undergo a substantial re-imagination to deliver brand new, jaw-dropping elements.General ticket prices for her 9 p.m. performances range from $59 to $229. 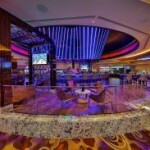 REMODELED CENTER BAR NOW OPEN AT HARD ROCK: The new Center Bar is now open at Hard Rock with an upgraded look, new lounge area, expanded cocktail menu and panoramic views of the casino floor. The new design maintains the raised and circular form of the original Center Bar. An LED light fixture hangs above the glowing tower bottle display and serves as the new focal point under a domed ceiling. There are also innovative video capabilities that allow for streaming colors matching the music videos playing on surrounding high-definitions TVs. CAMEO BRINGS THE FUNK AND RESIDENCY SHOW TO WESTGATE: Cameo will return to the stage with its classic funk sound and a new residency show on Wednesday, Oct. 7 in the Westgate Cabaret. 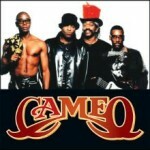 As one of the most influential groups in funk music in the 1970s and 1980s, Cameo will perform weekly Wednesday through Saturday at 7 p.m. Tickets will start at $79. WAHLBURGERS WILL MAKE LV-DEBUT AT GRAND BAZAAR SHOPS™: Wahburgers will open at the outdoor retail shopping attraction Grand Bazaar Shops in front of Bally’s this fall. The fast-casual burger restaurant founded by brothers Mark, Donnie and Paul Wahlberg and the subject of A&E Network’s Emmy-nominated reality show will feature gourmet burgers and specialty drinks. 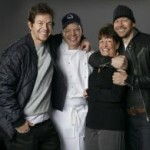 Wahlburgers will open at 10 a.m. daily and close at 10 p.m. and 11 p.m. on weekends. 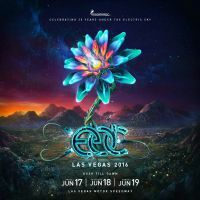 ELECTRIC DAISY CARNIVAL (EDC) SETS 2016 DATES: Insomniac announced that North America’s largest music festival, the Electric Daisy Carnival (EDC), will return to the Las Vegas Motor Speedway, June 17-19, 2016. Celebrating 20 years, tickets for EDC 2016 go on sale Monday, Sept. 21 at noon PT, months sooner than in past years to ensure fans have the lowest admission price possible. Starting on Oct. 1, 2015, all passes purchased will be subject to a 9 percent tax due to the passage of the amended Live Entertainment Tax (LET) in the city of Las Vegas. First tier three-day general admission passes start at the Early Owl price of $335 while VIP three-day passes are $699. Single day tickets will not be available for this three-day experience. This past June, more than 400,000 people from around the world attended EDC. 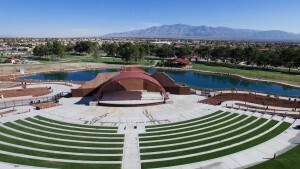 CRAIG RANCH REGIONAL PARK AMPHITHEATER OPENS WITH HEADLINERS: Craig Ranch Regional Park Amphitheater at 628 W. Craig Road is North Las Vegas area’s newest live entertainment venue. The facility will celebrate its public grand opening Oct. 9, 10, 23 and 24. The multi-thousand seat outdoor theater will present nationally-known acts: “Yesterday – The Beatles Tribute Show” on John Lennon’s birthday Friday, Oct. 9; original jazz-rock-blues band WAR on Saturday, Oct.10; country artist Sammy Kershaw on Friday, Oct. 23; and comedian Paul Rodriguez on Saturday, Oct. 24. Doors will open at 6 p.m. with shows at 8 p.m. Lawn seating is available on a first-come-first-serve basis. The amphitheater will offer specialty curated fare and libations for purchase from local food trucks and community concessionaires while guests who wish to bring their own fare are encouraged to do so and experience the park’s many amenities, gazebos and shade structures. Tickets to the opening night show “Yesterday” are specially-priced at $5 for Lawn and $10 for Reserved Seating, while all other October shows are $20 for Lawn and $25 for Reserved Seating. 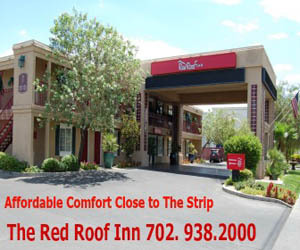 For information, call 702-633-2418 or visit craigranch.yapsody.com. BRIO TUSCAN GRILLE ROLLS OUT NEW MENU ITEMS FOR FALL: Brio Tuscan Grille (BRIO) has added an amazing array of enticing Italian dishes to its brunch, lunch and dinner menus. The new menu items are part of a nationwide refresh and all are being served at both Las Vegas locations in Tivoli Village and Town Square. 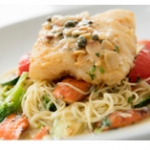 The recent menu additions follow the national celebration of the ristorante’s “Sweet 16” birthday. New lunch, dinner and brunch menu items range from $13.50 to $17.50. WORLD ZUU, FITNESS AND TRAINING PROGRAM, ENTERS U.S. MARKET: The World ZUU concept developed in 2008 by elite movement consultant Nathan Helberg out of Burleigh Heads, Australia, is set to open its first animal-based fitness and training venue in the United States on Sept. 14 in Las Vegas at 4985 S. Fort Apache Road. The ZUU program is a multidimensional training platform inclusive for all stages of physical development and fitness for all ages from school children to senior citizens. ZUU Fitness has already expanded to New Zealand, Asia, United Kingdom and Europe. Helberg will also deliver a free seminar from 6–7 p.m. on certain nights to explain ZUU’s origin. To reserve space or ask questions, call 808-385-0333. ONE DROP HOLDS FOURTH ANNUAL WALK FOR WATER: ONE DROP and Barrick Gold Corporation will host the fourth annual ONE DROP Walk for Water at 9 a.m. on Saturday, Oct. 17, giving everyone the opportunity to walk in the footsteps of the millions of people who are forced to walk miles every day to retrieve water. Participants will start at Symphony Park at The Smith Center and end at the Las Vegas Springs Preserve, where there will be music, food, face painting, carnival games, raffles and more. Walkers and teams can register online. Entry fees are $25 for walkers and $20 for students and seniors. Participants registering before Oct. 1 will receive a $5 discount. ‘VIVA OY VEGAS!’ – A VARIETY SHOW OF JEWISH (EPIC) PROPORTIONS: The Jewish Community Center (JCC) of Southern Nevada will present “Viva Oy Vegas!,” a variety show featuring some of the city’s best local Jewish talent including singers, dancers, comedians, and more on Oct. 17 at 8 p.m. and Oct. 18 at 2 p.m. The show will highlight Las Vegas performers such as Joy Demain, Elizabeth Bricker, Lou Magelowitz, Renée Hale and Jay Joseph at Baobab Theater in Town Square. Tickets are $18 for JCC members and $25 for non-members, call 702-794-0090. To make it easy for moms and dads to attend opening night Saturday, Oct. 17 the Jewish Community Center is offering Viva Oy Vegas!-themed kid programs on both the east and west sides of town from 6:30 – 10:30 p.m. For JCC members, the cost is $25 for the first child and $15 for each additional child; for non-members, $35 and $25. 2016 DATES SET FOR NHRA EVENTS AT THE STRIP AT LVMS: The 2016 schedule at The Strip at LVMS will mark the 16th consecutive year in which two major drag racing events are hosted in Las Vegas. Next year, Las Vegas is one of just three cities that will host two NHRA events next year, and the NHRA Toyota Nationals will once again be the season’s penultimate event. The NHRA Spring Nationals will take place April 1-3, while the NHRA Toyota Nationals is set for Oct. 27-30.This year, drag racing fans can enjoy NHRA Toyota Nationals Oct. 29-Nov. 1. EMERIL’S NEW ORLEANS FISH HOUSE AT MGM HOSTS OYSTER FESTIVAL: Emeril’s New Orleans Fish House at MGM Grand is hosting a 10-day Oyster Festival from Sept. 18-27. Chef Emeril Lagasse’s original Las Vegas restaurant will spotlight oysters from around the country with several market fresh varieties served raw and in classic hot preparations. On Sept. 18 from 2-4 p.m. the Oyster Fest will begin with a special Oyster Fest Kickoff Happy Hour featuring menu selections for $35. For tickets, call 702-891-7374. RÍ RÁ HOSTS HALFWAY TO ST. PATRICK’S DAY PARTY: On Thursday, Sept. 17, Rí Rá Las Vegas will host a “Halfway to St. Patrick’s Day” party featuring drink specials, giveaways, Irish music from The American Diddle Idols and an Irish-inspired menu benefitting HELP of Southern Nevada. From 9 p.m. to 12:30 a.m., Rí Rá will offer guests $5 Guinness® drafts, Guinness® black lagers and Guinness® foreign extra stouts during the celebration. Additionally, the pub will give away engraved Guinness® glasses to the first 50 guests who order a beer from the pub’s Victorian bar. The Guinness® Store next door will offer customers 20 percent off all 2015 limited edition collectibles. As part of the halfway mark celebration, Rí Rá will raise money for HELP of Southern Nevada from Sept. 15–21. All week long when guests order off of the pub’s special HELP menu, Rí Rá will donate 20 percent of all proceeds to the local nonprofit. 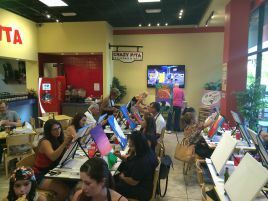 CRAZY PITA CONTINUES WITH PAINT PARTIES: Crazy Pita Rotisserie & Grill in Town Square is continuing to partner with Paint and Party Las Vegas by hosting Paint-Drink-Dine events twice a month on Tuesdays (Sept. 15, 29 and Oct. 13, 27) through Nov. 10 from 6-8 p.m. Guests get the option to choose from multiple portraits to paint and learn from local artists while creating a beautiful piece of artwork to keep or give as a gift. Cost is $30 and $20 for children 16 and under. Price includes painting materials and supplies along with one appetizer per table. Happy Hour prices 50 percent off beer and wine are offered to Paint Party guests. This event is all ages. Reservations required, call 702-778-3310. LVS TO BUILD 200,000 HYGIENE KITS WITH CLEAN THE WORLD: Las Vegas Sands Corp. (NYSE: LVS) and international nonprofit Clean the World invite everyone to join The Venetian and The Palazzo team members on Sept. 26 in an unprecedented 24-hour global volunteer effort to build 200,000 hygiene kits that will improve the health and well being of vulnerable populations worldwide. The build will be held at LVS’ Macao, Singapore, Bethlehem and Las Vegas properties sequentially and all within a 24-hour period. Volunteers can sign up at http://vegasctw2015.eventbrite.com/ for two-hour shifts to assemble kits: noon- 2 p.m., 2-4 p.m., and 4-6 p.m.
FAST TRACKING: Comedienne Whitney Cummings returns to “LIPSHTICK – The Perfect Shade of Stand Up” at The Venetian on Saturday, Sept. 19 at 9:30 p.m. She is fresh off recording her HBO stand-up special and is developing an HBO series, which she will write and star in based on the book “Are Men Necessary? When Sexes Collide.” The hit CBS sitcom, “2 Broke Girls,” which Cummings co-created, was also recently renewed for a fifth season. The celebrity guest keg tappers at Hofbrauhaus this year will be Strip headliner Terry Fator on Oct 2 and Rick Harrison from “Pawn Stars” on Oct 3, both at 7 p.m., and Dirk Vermin on Oct 10 at 9 p.m. The Who have postponed four shows of their fall “The Who Hits 50!” North American tour to allow lead singer Roger Daltrey proper time to recover from an unspecified virus he contracted. Based on doctor’s orders, the first four dates of the tour launch including Sept. 19 at The Colosseum at Caesars Palace have been postponed. 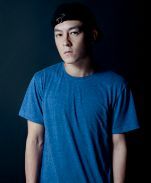 The Moon Festival, a celebration of Chinese music and culture, will take place at the Boulevard Pool at The Cosmopolitan on Saturday, Sept. 26 at 8 p.m. with Edison Chen headlining. Chen is a Hong Kong Canadian actor, musician, fashion designer and entrepreneur known for his energetic and lively stage presence. 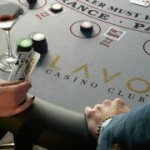 Joe Manganiello hosted the grand opening of the LAVO Casino Club at The Palazzo, which is a modern gaming experience fusing blackjack and craps table games with craft cocktails, bottle service and LAVO’s signature Italian restaurant menu. Wet’n’Wild will host Fun in the Sun for The Shade Tree Drive on Saturday, Sept. 19. People who bring a package of new socks in children or adult sizes or a case of bottled water to the park that day can purchase park tickets for $19.99. All items collected will be donated to The Shade Tree, and help women and children living at the shelter. The speakers for this month’s “Conversations at the National Atomic Testing Museum” series at 7 p.m. will be radio host Alejandro Rojas on Sept. 18 presenting “Area 51 & Aliens: Another UFO Disinformation Scandal?” and TV personality and space scientist Ben McGee discussing “NERVA: To Mars & Beyond!” on Sept. 19. Lectures with meet and greet at 6 p.m. are free for museum members and $10 for non-members, call 702-794-5151. DINING SPECIALS AND NEWS: Hash House A Go Go’s 6800 West Sahara location turns 10 years old this month. To celebrate, the one location is offering 10 of its most popular items for just $10 over the last 10 days in September. Each day is a different offer starting on Monday, Sept. 21 with BLT Marys and ending Wednesday, Sept. 30 with Kiwi Watermelon Lemonade with souvenir glass. 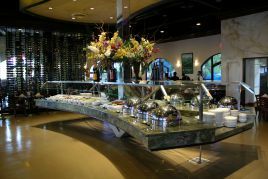 Summerlin area’s Via Brasil Steakhouse has been serving up traditional Rodizio-style Brazilian dinners for the past six years and now offers a brunch menu for $24.99 from 10 a.m. to 2 p.m. on Sundays only. The brunch includes a selection of eight different meats carved tableside, a buffet with up to 40 different breakfast and brunch items and a chef-manned made-to-order station. At Mercadito in the Red Rock Resort this month, Las Vegans can indulge in Chef Canteenwalla’s Salt & Vinegar Chicken Oyster Taco during dinner for $16.50 (four per order). A percentage of the proceeds will benefit Share Our Strength and its programs to fight childhood hunger. Hakkasan will celebrate the annual Chinese holiday Golden Week between Monday, Sept. 28 and Sunday, Oct. 18 at its locations around the world. Hakkasan Las Vegas restaurant will feature a limited edition signature menu priced at $138.88 for parties of two or more. 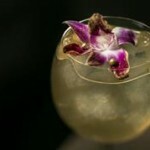 A signature cocktail will be the Golden Iced Tea for $7. A longtime supporter of Las Vegas Restaurant Week, Bobby Flay’s Mesa Grill at Caesars Palace was honored earlier this month by Three Square Food Bank with its seventh Gold Plate donor award. As a result of selling 2,226 covers, Mesa Grill contributed more than $11,000 to the nonprofit agency over the span of June 15 to June 26, 2015. CASA FUENTE OWNS PRIVATE BARREL OF ASIAN WHISKY: Casa Fuente, Las Vegas’ premier cigar lounge inside the Forum Shops at Caesars Palace, has made history by being the first drinking establishment in the North American market to currently own a private barrel of Asian Whisky. Working with Southern Wine & Spirits of Nevada and embarking into uncharted territory, Casa Fuente has secured a barrel of KAVALAN Taiwanese Whisky and will sell the World’s No. 1 Whiskey beginning Oct. 10. Casa Fuente will have 489 bottles of the hand selected and bottled Asian whisky available for purchase, all individually numbered for $165 per bottle.